Saying a race at Talladega Superspeedway is going to be unpredictable and a little crazy is a little like saying the Brooklyn Bridge is a bridge. Seemingly every race since the Alabama track opened back in 1969 has been just that. But the Geico 500 this Sunday is going to be different, in my opinion, than most races prior considering what is on the line in this race. What will make this race different? First, it is the new Chase for the Sprint Cup format. As with the new format, there are three elimination rounds that will whittle the field from 16 drivers at the first race at Chicagoland until there are four drivers left at Homestead-Miami. 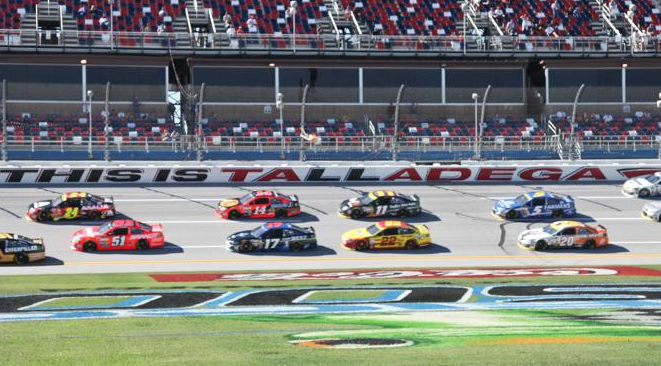 Tomorrow's race at Talladega is an elimination race in the Contender Round and after the race, four driver's hopes of winning the Chase are gone. Need anymore reason to watch tomorrow? How about the drivers that are currently on the outside looking in in the points? Said drivers are Matt Kenseth (one point behind eighth-place Kasey Kahne), Brad Keselowski (19 points behind Kahne), Jimmie Johnson (26 points behind Kahne), and Dale Earnhardt Jr. (also 26 points behind Kahne). All of those drivers were thought to be championship contenders at one point or another this season, three of them are past champions, but after having inconsistent finishes at Kansas and Charlotte they are all in danger of being eliminated. With the exception of Kenseth, these drivers are all but certain to have to win the race on Sunday to survive and advance. And all four have won restrictor place races before: Kenseth three times (once at 'Dega, last time in 2012), Keselowski twice (both at 'Dega, last in 2012), Johnson four times (once at 'Dega, last in 2011), and Earnhardt eight times (five at 'Dega, last in 2004). But while these drivers are racing for their Chase lives, they aren't alone. In fact given how the Big One can change everything, no driver (save for those who have already advanced in Joey Logano and Kevin Harvick) is safe. With so much on the line this Sunday, we will likely see a great variety of strategies. Logano and Harvick can afford to play it safe and, to a certain extent, Kyle Busch (second in points) can as well. The drivers on the outside looking in have to win. The current drivers in the clear in the Chase (Busch, Ryan Newman, Carl Edwards, Jeff Gordon and Denny Hamlin) have to avoid a wreck that kill them in the points, although a win certainly would be nice. Kahne is barely in the Chase so he's in the precarious position of having to win just to advance even as he is in the clear at the moment. And of course, we've got all the other drivers in the field are trying to win. For better and for worse, the restrictor plate tracks have always been exciting but this race with all that is on the line may just be something else.